Fisher Tank provides tank design and engineering per API 650, API 620, API 653, AWWA D-100, AWWA Section 14 and NFPA/FM global. Our in-house engineering team works with these standards as well as our clients' drawings to perform custom engineering for each project. We have 18 dedicated tank crews led by our experienced Fisher Tank Foremen, equipped to provide expert on-site tank construction. Our crews are trained boilermakers, and our team of Foremen have decades of experience and are committed to Fisher Tank's standards of safety, quality and productivity. We've been building and repairing welded steel tanks since 1948, so there's not much we have not seen in terms of tank repairs and modifications. Our expert crews provide modifications and repairs per API 653. Our estimating team is adept at helping our clients determine efficient and economical approaches to repair projects. 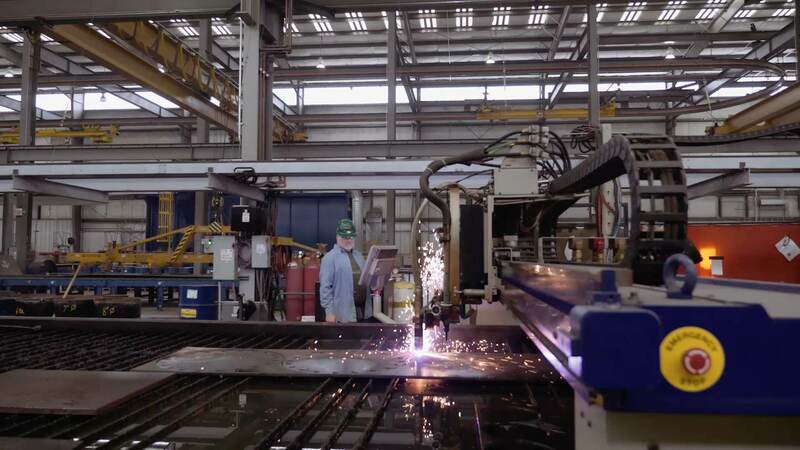 Our fabrication shops in Leesville, SC, and Chester, PA, offer state of the art tank fabrication , including plate rolling, beveling and cutting, as well as custom fabrication for elements like platforms, manways, platforms and bridges. Welcome to The Think Tank blog! Please join us for information about Fisher Tank and our people and projects, tank construction and repair case studies, articles from industry experts, safety information and much more. Use our free Tank Volume Calculator to determine the volume of any ground storage tank. Planning a tank project? Get some guidance with our free project planning worksheets. Check out all our free resources for useful tank info. Get to know us! Check out some of our favorite Fisher Tank videos here. The Total Cost of Ownership Tool lets you compare the lifetime costs of welded steel, concrete and bolted tanks. This tool is free to use and is a great way to help assess the overall value of a potential tank solution. Fisher Tank has been CSX's primary tank contractor for over 15 years during which they have proven themselves to be an invaluable partner. The nature of their work necessitates an understanding of different CSX departments and developing a plan to accomplish the project without disrupting operations. Their strengths come from a commitment to safety, being cost conscious, and developing relationships with terminal personnel. Our safety department did a complete audit on your operation. They relayed their findings to our project management and they said it was one of the best operations they have seen on site. Your group has gone above and beyond to identify diamond category (the potential to seriously hurt or kill someone) items, and they have been indicating those on their daily JHA/JSAs. We have also received multiple reports of how receptive your group is to feedback, and how great they are to work with. In our weekly schedule meeting, our project manager re-iterated how well our subs have been doing, and recognized your group by name as having an outstanding JHA/JSA. Thanks for your group's attention to safety on this site, and for the outstanding work they have been doing. I just wanted to say thanks for removing our tank bottom floor out of Tank #114. The crew you sent under the direction of Doug Hill did an excellent job. I have never seen something like this done before. I did learn a few things from Doug, he certainly has a lot of knowledge. Thank you for having Doug Hill and his Crew build our DI Tank. It has been a great pleasure working with all of these guys! They are some of the hardest working men that I have worked with in a very long time. You folks at Fisher can and should be very proud to have ALL of these men…They have gone the Extra mile here at Perryman 6 with SAFETY and [they were] STILL able to meet our schedule. Doug and his [crew] showed that you can work safely and still complete your work on time. Thanks for all the hard work." I have to respond quickly to opportunities, and Fisher helps me be more successful by understanding that. They respond with urgency and with a willingness to help me put together winning bids. They always seem to understand that we're in this together. Fisher Tank has been great to work with! Very courteous and conscientious group willing to go the extra mile. Request a quote for your next storage tank project.